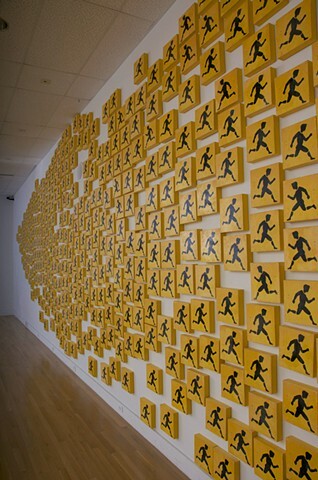 Perspective view of "Run" installation. Slow, Children at Play hangs from a rusting post near the railroad tracks. The sign is from the not so distant past. The figure is indeed fragmented yet still holds its curvilinear articulation. A running silhouette conjures up notions of innocence, life, youth, energy, and the joy of human movement itself. The field of cracking yellow paint, rock chipped and scarred by bee bees and bullets, signals an awareness and poses questions to our own human nature and culture past – present – future. This new experimental body of work is informed in part by Fra Angelico’s use of the fragmented figure as symbol and narrative in his 15th century frescoes that occupy the walls at the monastery of San Marco in Florence, Italy. This work is also inspired by my love of running, the language of the road, and by the exploration of small towns throughout the local landscape.